The two ladies you see laughing in the foreground in turquoise suits are Sisters of St. Joseph of Peace from Longview, Washington. The one at the left is Sister Francena Dodd and next to her is Sister Ann Hayes, today at Trinity University, Washington, DC. They were attending a Catholic Health Assembly in San Diego in 2005. 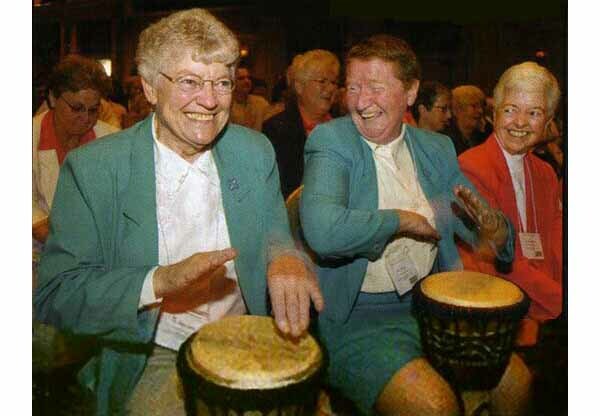 For the opening ceremony, they found nothing more suitable than to play the conga drums. This represents an evident lack of seriousness for religious women, who should be Spouses of Christ rejecting the world to console Him in His Passion and to help their neighbors carry their crosses. Besides, to be played the conga drum must be held by the thighs, which means a woman has to raise her skirt up. As seen in this photo, the two Vatican II nuns had no problem doing this and offering a partial view of their upper legs.